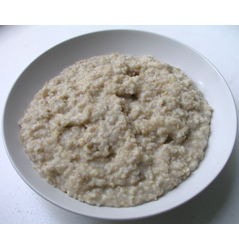 Quick High Protein Muscle Recipe – Proats! I love easy, high-protein recipes. This one is 100% G.L.A.D. Diet approved and is ridiculously easy to make! The GL for this recipe is 10, so it’s a good choice in terms of controlling blood sugar levels. I had already thought of this combo before, but as cooked whey tastes disgusting, (as anyone who has ever tried to make protein pancakes with whey can attest to) I never actually went as far as to actually make it. However, there is an easy way around this. Cook your oats in some water while you make a whey shake with milk separately. Then when the oats are ready, pour the milky whey goodness on top and mix it in 🙂 . * Mix together your water and oats and microwave for 1.5 minutes. It really tastes great, especially with vanilla or banana flavored whey. I would imagine raspberry or strawberry would be too weird of a combination. So you’ve got some quality protein, some slow-releasing carbs, and if you want to be really healthy, sprinkle a teaspoon of flax seed on top for some essential fatty acids. Actually, strawberry is a really good combination. Just think “Strawberry’s and Cream” and it will make sense. I use isopure zero carb strawberry cream and it’s good. This is cool. I’ve been making this for a while. I tend to put the oats and a whey/casein blend in a bowl and pour over just off the boil water. Mix and stand. To ease the taste it’s good to add a small amount of fruit (raspberries my fav) but not to many. This has reminded me I need to read up on the GLAD diet, I’m designing my own at the mo – but you’ve got it down. Just kidding, I’ll try it out whenever I pick up some strawberry whey again. @Chris. Yeah, blueberries work well and are very GLAD friendly. I’ll be revising the GLAD diet soon and will be posting it up here in the next couple of weeks for you guys. I’m “GLAD” to hear about your doing an update to the GLAD program. I think it has a lot of potential to be the answer to the rigors of low carb dieting and the CKD. Looking forward to reading! Other “GLAD-iators” will be excited I’m sure. My DH is a big fan of prot-milk and proats already. You really don’t even need milk with the proats. You can just stir it in to the oats AFTER cooking and it works just fine. He likes just plain whey protein isolate (I think it’s the stuff from “True Protein”) with no sweeteners/flavors. That’s the best oatmeal he’s ever had, he said. I may try this with some steel cut oats tomorrow. Good on ya, Mark! Friend of mine is doing great on MANS/TSPA, but I find that I don’t eat enough on those diets and so I don’t recover well. I’m really looking forward to the revised GLAD diet! @Darrin. Sounds good man, thanks. @Andrew. It’s how I’m going to eat after my current cut too. It’ll be great when I’ve got it done! @Michelle. Give it a go. I really like vanilla the best. Funny because I dislike vanilla shakes. @Jennifer. Sounds delish and very healthy! New GLAD should be up within 2 weeks. Nothing too surprising. Power Lifters have been eating this as a pre-workout meal for decades. Its got slow burning carbs for lasting energy and whey for amino acids and BCAAs. In fact Optimum Nutrition made an all in one packet for this: Oats & Whey. I usually eat this closer to bed time but with a whey and casein blend and two tablespoons of peanut butter (easier to blend by the way). Morning to all, carb-up today so I just had me some Proats with vanilla whey & it tastes great. thanks alot mark. i can add this one in my meal list. hey mark.. i am actually trying to not build muscle without taking any protein shakes or supplements. lets see how far i go :). but i was looking at your idea of ‘proats’ and thought that i mihgt try to make my own natural version. so far i have been mixing raw oats with flaked almonds as a morning cereal. i’m wondering if that packs the same amount of nutrition as compared to oats mixed up with a protein shake? i normally eat 2 eggs/vegetables before i eat about 1/2 a cups mixture of oats/almonds/milk.